As with a few of the other emails this strikes me as more malware or someone posing as Accredited Debt Relief which is a real company. There are any number of Debt Relief Scams so people should educate themselves before accepting the first good story. The complaint on RipOff Report linked below is rather interesting, if true it indicates Accredited Debt Relief is a reseller for Freedom Debt Relief, the last link. West Africa Fund Monitoring Unit. Your fund will be transfer to you via MasterCard ATM which is cash-able in any ATM machine or Bank anywhere in the world. the Insurance Coverage Certificate of your package. your funds to avoid any further problem. Contact him once you received this email. subject to a fine of $20,000, or imprisonment of not more than five years . Attn Beneficiary, Your total fund in the card is $6M. Am Officer, Barr. Diplomat Ben King. Several Attempt has been made to get your fund to you but all failed. After considering my position as an Officer and Barr. I was chosen to deliver your Package to you as am the only one to ensure the safe delivery of your package. Due to problems encountered, your fund has been loaded in ATM card. Your total fund in the card is $6M. I just arrived John F Kennedy International Airport, So confirm your below information now so that we can proceed with the delivery to your home now. Tele phone: +1 (206) 743 9708. You can email, call or text. All the arrangement is done about your ATM CARD,there is no problem again but i let you know that . and ask them how much is activation fee of your ATM CARD,and too ask them where you can send it. Remember that immediately the ATM CARD will delivery to you, every day you will Withdraw $4000 dollar until all your total ATM MASTER CARD will got finish.Immediately you receive this email call me here +22966529457 for more explanation. Attention:Fund Owner. Do Urgent You Response Back. of beneficiaries inheritance and contract payment. check up with the data's we have in our central computer. deliver your Package worth $9.6 Million Dollars to you; Name: Rose C.
YOUR FUND RELEASE STATUS...........TREAT AS URGENT......VERY IMPORTANT!! View her Pics Now. It's Free! Desperate Asian Girls Looking for Dates! Real foundation, but this is BS. The scam adviser site provides contact details that don't jive with this garbage. Donation Of $1,500.000.00 for you and family! We are officially informing you that the AFRICAN UNION COMPENSATION COMMISSION headquartered in Addis Ababa, Ethiopia with the directives of the IMF, AU and American embassy in Benin Republic have concluded all the necessary arrangement for the release of all your outstanding fund totaling the sum of Seven million, five hundred thousand United States Dollars only (7.5m usd) which after due consideration was credited to an ATM MASTER CARD to easy up the transfer process which was highly monitored by all parties concerned. To avoid loosing it to any third party, you are kindly advised to reconfirm urgently, the below informations as we shall not be blamed on account of non compliance . 4.Your I D card/Driving License. That will enable us to commence with every necessary arrangement with your preferred delivery company which will be made available to you shortly for the immediate mailing within the working days to your address as we look forward to your reconfirmation and strict compliance. will carry out the business. PLEASE WE ARE VERY SORRY FOR ALL THE PROBLEM THAT YOU HAVE PASSED THROUGH BECAUSE OF THIS YOUR BELONG PAYMENT OF WHICH YOU FAILED TILL NOW, FIRST OF ALL, I WANT TO INTRODUCE MY SELF TO YOU, MY NAME IS Mr. Jerry Howard,I AM THE NEW ELECTED DIRECTOR GENERAL OF WESTERN UNION OFFICE BENIN REPUBLIC I HAVE BEEN CHOSEN LAST WEEK. 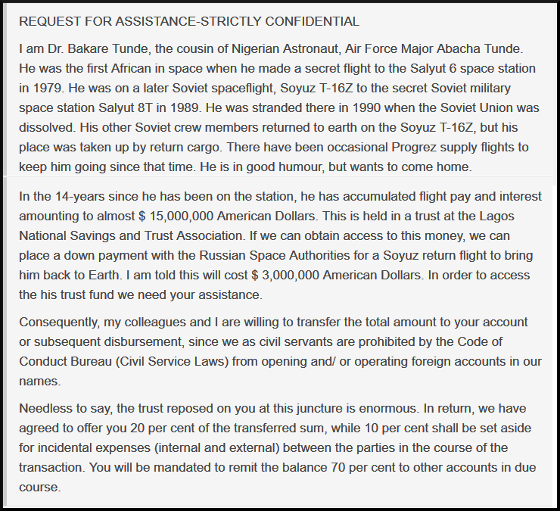 I AM WRITING THIS MAIL WITH DEEP SORROW, I SAW YOUR NAME ON OUR FILE YESTERDAY THROUGH MY SEARCHING AS THE ONE OF THE MOST BENEFICIARY WHICH DID NOT RECEIVE YOUR FUND VALUED ($7.5 MILLIONS USD) WHICH SUPPOSES TO BE TRANSFERRING AT THE RATE OF $5,000.00 PER DAY DURING FORMER MANAGER REGIME. SO NOW WE HAVE ARRANGED TO PAY YOU BECAUSE ALL OUR INVESTIGATED CONFIRMED THAT YOU ARE THE RIGHT PERSON TO RECEIVE THIS FUND NOTE WE HAVE TWO OPTION TO PAY YOU AND YOU THE ONE TO MAKE YOUR CHOICE OPTION (1) 0UR WESTERN UNION GOLD CARD WHICH YOU WILL WITHDRAW DAILY $4000.00 OPTION (2) RECEIVE DAILY CASH $5,000.00 TILL THE TOTAL PAYMENT COMPLETED. THERE IS ONE CERTIFICATE CALLED (FUND RELEASE ORDER CERTIFICATES) WHICH YOU SUPPOSE TO OBTAIN FROM FEDERAL HIGH COURT SERVICES WHICH WILL NOTICED THAT YOU ARE NOT A BENIN CITIZEN BUT YOU DID NOT HAVE IT AND THAT IS ONLY WHAT YOU NEEDED NOW. Phone Number +1(720) 642-5086 .
canceled. Number to call is below +1(720) 642-5086 .